Studies have strongly suggested a disturbed regulation of dopaminergic neurotransmission in attention-deficit/hyperactivity disorder (ADHD) and Parkinson’s disease (PD). A genetic and phenotypic overlap between both disorders is discussed. A well-studied risk gene for PD is the gene coding for α-synuclein (SNCA). α-Synuclein, a protein located primarily in the presynaptic vesicles, has been suggested to play a role in the modulation of dopamine transporter (DAT) function. DAT is the target of psychostimulants for the treatment of ADHD and plays a key role in regulating the dopamine concentrations in the synaptic cleft. In our sample consisting of German families with children affected by ADHD, we tested for association of allelic variants of two functionally relevant polymorphisms of the α-synuclein gene (NACP-Rep1: 156 families, 232 children; rs356219: 195 families, 284 children) with ADHD. Transmission disequilibrium test analysis revealed no over-transmission for NACP-Rep1 (OR 1, pnom = 1 padj = 1) and rs356219 (OR 1.28; pnom = 0288) in affected siblings. However, a subanalysis on trios with index children showed a nominal association of rs356219 with ADHD (OR 1.43, pnom = 0.020), which survived Bonferroni correction (padj = 0.039); again, no association for NACP-Rep1 (OR 0.8, p = 0.317, padj = 0.634) was found. In conclusion, we found in our pilot study a trend for an association of the rs356219 genotype in SNCA that may affect α-synuclein function and contribute to the aetiology of ADHD. 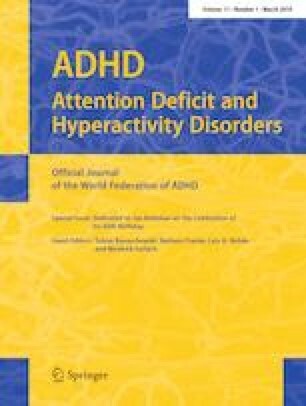 In light of the small sample size of our study, the link between PD and ADHD through dopamine-related neurobiology warrants further investigations. Future studies on SNCA in large ADHD samples should focus on specified symptoms and traits, e.g. attentional capacities or emotional dysregulation.